The Pittsburgh Steelers spent a significant portion of their 2018 season alienating running back Le’Veon Bell for wanting job security, then the players who were there argued with each other, and then they had to hope for the Browns to win in order to get into the playoffs. (The Browns did not win.) The team appears to have a sequel to this ordeal in production, this time with receiver Antonio Brown. Days before the Steelers’ Week 17 game, Brown got into an argument with and threw a football toward quarterback Ben Roethlisberger, then disappeared from practice. The receiver didn’t play in the team’s last game of the season due to a vague knee injury that was reportedly a cover for his unexpected absence. Brown also skipped the team’s exit meetings and hasn’t talked to his coach Mike Tomlin in weeks. That wasn’t his only disappearing act of the season. In Week 2, Brown was seen arguing with his coaches as the Steelers were losing to the Chiefs. 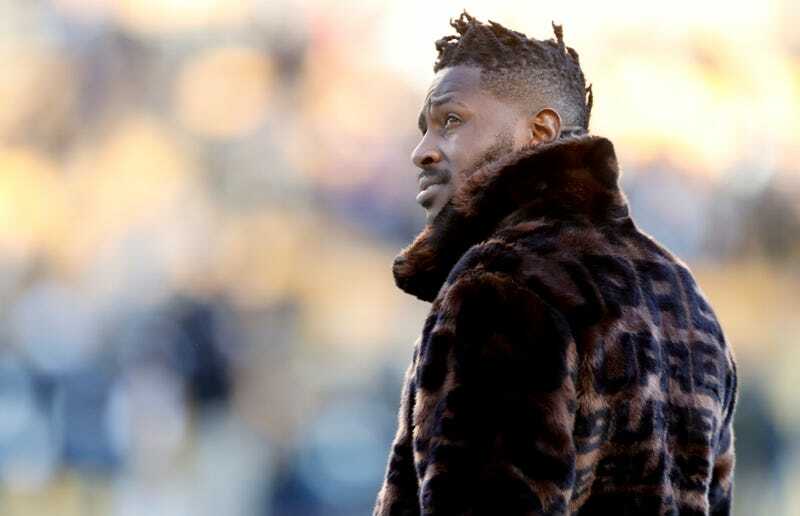 The day after the defeat, he tweeted, “Trade me let’s find out” when a former team staffer claimed Roethlisberger was responsible for the receiver’s success. The next day, Brown didn’t show up to practice. Brown is scheduled to count $22,165,000 against the salary cap in 2019. If the Steelers trade him, he would still count $21,120,000 against their cap — $12.6 million salary, $7 million pro-rated signing bonus and $2.5 million roster bonus. However, the Steelers would save $15.1 million — his 2019 salary plus roster bonus — in real money. Rooney, though, indicated Brown’s salary-cap ramifications would not play into whatever decision the team makes. Anyway, there’s a good chance the Steelers do this again in 2020 with JuJu Smith-Schuster when he wants a new contract, leading a bunch of Yinzers to turn on him and say he should be kissing the feet of the big, lecherous, potato-shaped quarterback who loves to huff and puff about all his teammates’ mistakes. Le&apos;Veon Bell Will Sit Out The Season. Now What?